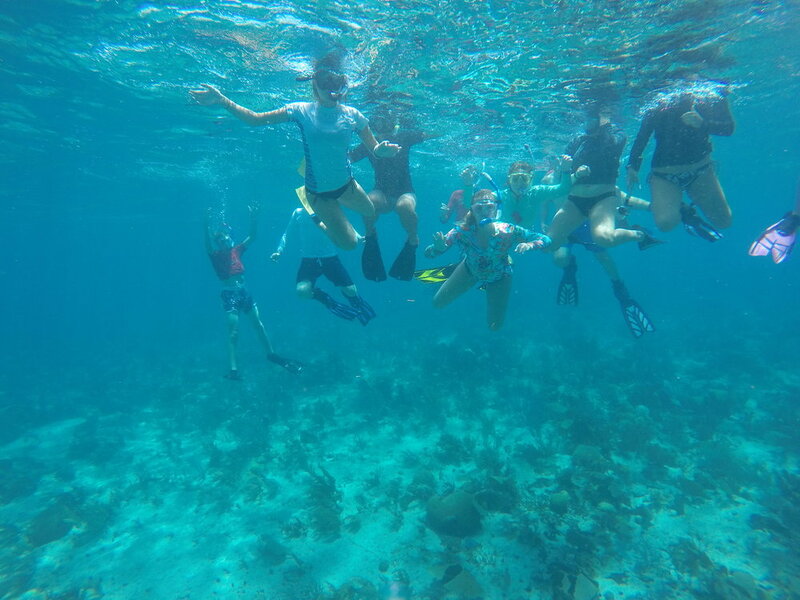 Snorkeling on the Belize Barrier Reef. Several weeks ago, we took 18 students to a small island perched atop the Belize Barrier Reef, 14 miles offshore from the mainland of Belize. Our group consisted of kids from Sanibel, all over the US, England, and two Sanibel Sea School faculty. The Belize Barrier Reef is a section of the Mesoamerican Barrier Reef, the second largest barrier reef system in the world. The small island we occupied is in the South Water Caye Marine Reserve – a marine sanctuary set aside to help conserve this biologically rich area. Spending time at a biological field station is a powerful experience for young people. We are steps from the ocean and spend nearly all waking hours focused on the coral reefs that surround us. On the bus ride from Belize City to Dangriga. In the airport, we collected all cellular devices from our participants. The first step to a week of being unplugged, and focusing on the adventure at hand. On our flight over the Gulf of Mexico, each of us had a writing exercise – to record our anticipations and expectations. After landing in Belize City, we had a three-hour bus ride in an open window (no air conditioning) bus through the varied highlands of Belize; this offered us spectacular views of many forest and plant communities found in Belize. We had our first Belizean meal while rolling down the curvy roads along the way. 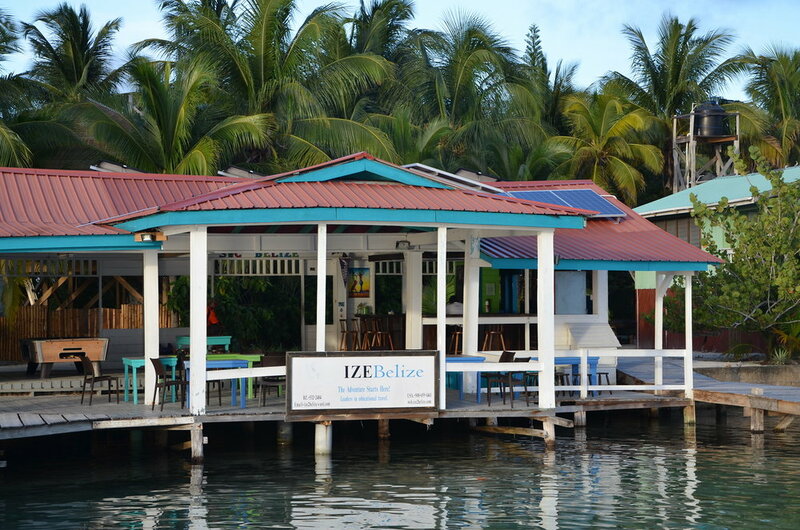 The IZE Field Station on South Water Caye. After a 45-minute boat ride, we finally arrived at the International Zoological Expedition’s field station on South Water Caye. Within an hour, we were settled in, and in the water for our first snorkel on a patch reef adjacent to the island. This is a spectacular reef, with many healthy corals, spotted eagle rays, nurse sharks, and many coral reef inhabitants – some of which were new to us, but many were species we had seen before. There is a certain joy on returning to a coral reef – you see so many ‘old friends’, those creatures you have seen before, but have not for a long period of time. Evening views from the field station. The food was fantastic – locally sourced and freshly prepared by local cooks. And food is important when trying to keep up with the energetic demands of teenagers actively engaged in physical activities all day long. An exciting game of Monopoly after dinner. We had boat trips each morning to different parts of the barrier reef and different marine habitats. Afternoons were spent on independent snorkels, conducting research, working on mandatory art projects, writing and forming lasting friendships in this new environment that did not include technology. We played cards and Monopoly and Clue in the evenings; it is a treat to watch a large group of teenagers engage with one-another without the intervention of online services. Heading out to the reef for a snorkel. Our crew had significant exposure to cutting-edge coral reef research. We toured the adjacent island, Carrie Bow Caye, which is the home to the Smithsonian Institute’s Coral Reef Research Station. There we saw research being conducted by visiting research scientists and learned about their efforts to document the effects of climate change on select species of coral. We shared our field station on South Water Caye with a research team from Boston University, who were studying the mating and larval behavior of Neon Gobys, small fish that live in sponges on the reef. One evening, they gave us a presentation on that research one evening. A Brown Booby flies over our group of snorkelers. Each day, we all chose one marine species, researched it, and at our family style dinners – one large table with 20 people, we all shared the information we had learned about our species of the day. 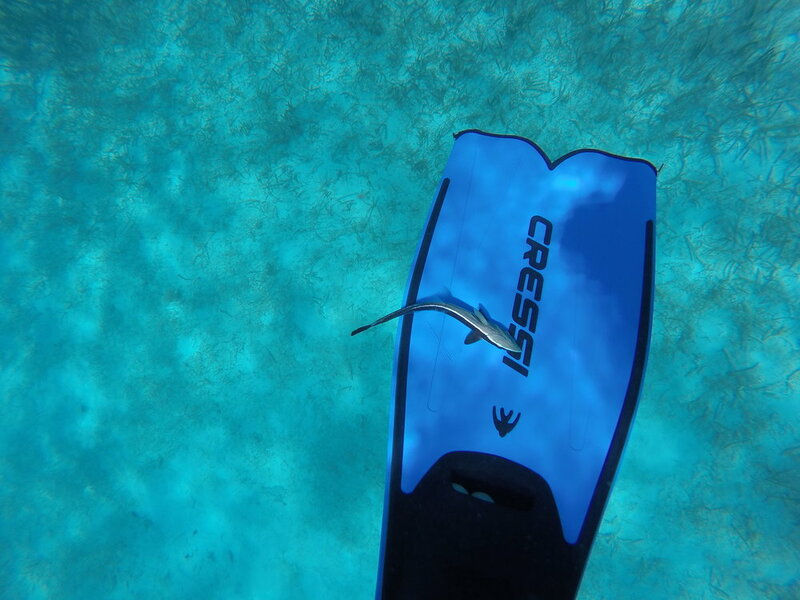 A remora attached itself to one of our snorkelers. Sanibel Sea School is dedicated to improving the ocean’s future – one person at a time. Offering international trips like these is an important opportunity for young people to experience new countries, better become acquainted with coral reefs, and find time to become better acquainted with themselves. Click here to view the full album of photos from our trip.